Let's flash back to 1991, when I was an impressionable young gamer still experiencing her first console games [EN: In her younger and more vulnerable years]. I had the opportunity to borrow this "super hard" title from my cousin, who insisted she hated the thing because she couldn't figure out the puzzles. Challenge accepted. The loaned cartridge was Maniac Mansion, arguably one of the most influential releases in the point-and-click genre. It is undeniably the genesis of my love for that style of video games. Most fans of the genre, and even many developers, making new series with those key themes, regard Maniac Mansion as the revolutionary game that started it all, back in 1987. 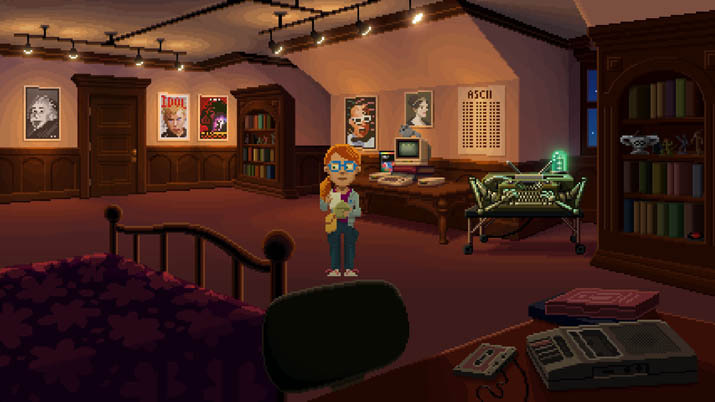 Thimbleweed Park developer Ron Gilbert was one of the designers of the SCUMM engine [Mike Bevan, “The SCUMM Diary: Stories behind one of the greatest game engines ever made,” Gamasutra]. SCUMM, or Script Creation Utility for Maniac Mansion, would become a cornerstone development system for the genre for years to come. The notion of challenging players to Verb-the-Noun-in-the-Noun was perfected by this duo. 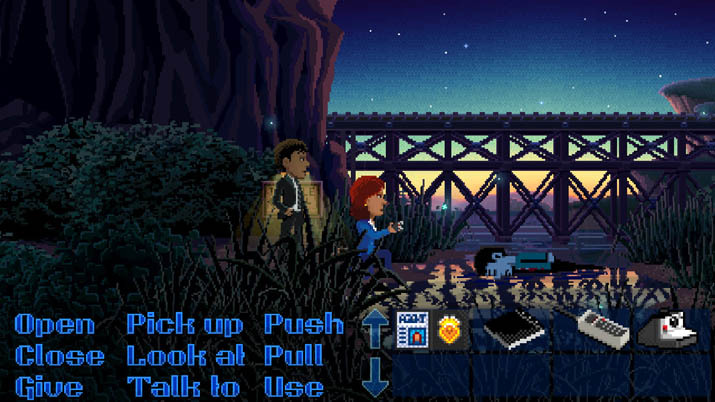 Now, these legendary point-and-click masterminds are at it once again with Thimbleweed Park. Thimbleweed Park is a small town populated by intriguing people, and players have an opportunity to fill the shoes of five separate characters while interacting with dozens of townsfolk. It's a "neo-noir mystery" set in 1987, so there's plenty of Retro-licious nostalgia at play here, including cameos from characters originally seen in other titles that Gilbert and Winnick have helped to develop. But Thimbleweed Park goes one step further, delivering not only an intelligent plot and witty dialog but also a polished interface, stellar voice acting, and even the precious joy of accelerated walking speed. These unexpected gems help to create an impressive package, and within a few hours of gameplay, I knew that Thimbleweed Park would become a hallmark example of everything there is to love about point-and-click. The storyline twists and turns through flashbacks, multiple dialog choices, and subtle clues to tell the tale of the strange happenings of this quiet village. Agent Ray is a dedicated, savvy FBI employee tasked with solving a brutal murder; Junior Agent Reyes makes up for his inexperience in enthusiasm and misplaced optimism, yet both of these starting characters are in the town of Thimbleweed Park for reasons other than solving a heinous crime. It's a title that doesn't hesitate to break the fourth wall, making lighthearted fun of itself, fans of the genre, and the stars of the game. Steam Achievements abound, plus full controller support, and subtitles in five languages, giving players more features to enjoy. The graphics are pixelated joy, and there's a ton of detail in the scenes, with plenty of nifty objects with humorous descriptions. Thimbleweed Park has numerous locations within the confines of its geography – including the town itself, an abandoned amusement park, a posh (and haunted) hotel, plus the added treat of a visit to some of the original Maniac Mansion spots, redesigned for a new era. I love that this is a point-and-click title that rewards players for paying close attention to item combinations, off-hand commentary from random townspeople, and even interaction between the cast of playable characters. For fans of Maniac Mansion, Day of the Tentacle, Monkey Island, and other point-and-click classics, Thimbleweed Park is a buffet of reminiscent references and images. More importantly, if you never played those hit titles - and I would recommend you remedy this immediately, if you love the genre - you can still enjoy Thimbleweed Park as a modern, polished, hilarious example of pixelated point-and-click gold. The more obscure references felt like a tribute to die-hard fans of Gilbert and Winnick's work, and these treats made me eager to return to those long-ago masterpieces (for a third or fourth time). A feature of Thimbleweed Park that lends to its versatile, newcomer-friendly aspect is the incorporation of Casual Mode and Hard Mode. "One of the things I did with Monkey Island 2 that I liked is that it had that easy and hard mode to it. 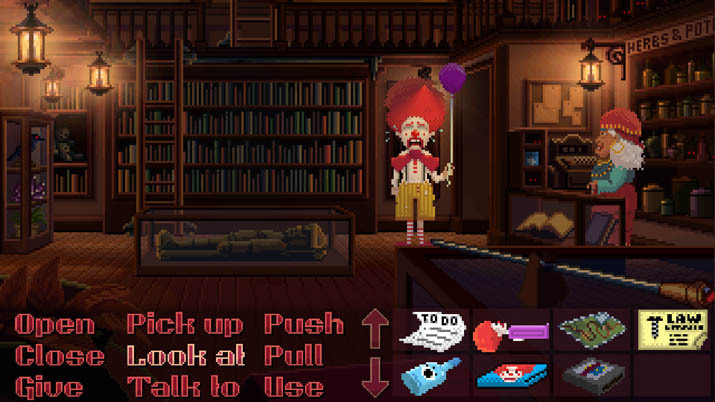 We want to add that to Thimbleweed Park, so if you are somebody that doesn't want to dedicate a whole lot of time to the game, you can play it in easy mode," explained Gilbert in an interview with Marek Bronstring [Douglas Crockford, "The Untold Story of Maniac Mansion," Wired Magazine]. "You still get the full story, but some of the puzzles have been simplified. Then you could even go back and play it again in hard mode, and there's this whole other layer of puzzles that you might have to solve." As a veteran of the point-and-click genre I chose to play on Hard mode, but I did a brief run in Casual mode afterward, and it's certainly a more simplified experience. The complexity of the puzzles and their ingenuity, which do not delve into the pits of overly-obtuse despair, is nothing less than I had expected from Gilbert and Winnick. Fortunately, modern developers have more flexibility when it comes to platforms. While Maniac Mansion had to navigate Nintendo of America's strict censorship, Thimbleweed Park is free to be as tongue-in-cheek, suggestive, and risqué as the developers desired. There's still no foul language – *beeping* dialog not included – but Thimbleweed Park carries ESRB content descriptors for Drug References, Sexual Themes, Use of Alcohol and Tobacco, and more. As Mark Bronstring states in Adventure gamer, the Maniac Mansion team discovered that, according to Nintendo, "the baddest bad word is kill. The central activity in most Nintendo games is killing things. The image and the act are good, but the word is bad, even if the word does not suggest the image or the act" [Marek Bronstring, "Ron Gilbert and Gary Winnick – Thimbleweed Park," Adventure Gamers]. The Teen Rating is appropriate, but a mature Adventure – even wrapped in a pixelated bundle – is a welcome reprieve from the more family-friendly, wholesome goodness that inhabits this genre. Fans of any genre have certain titles that they would pitch to someone who has never sampled that style of game, not to mention must-play recommendations that they would advocate at length. Thimbleweed Park is a shining example of the ideal in the point-and-click genre, featuring the puzzles, storylines, dialog, and other goodies that bring players like me back, time and time again. Without a doubt, were I trying to recruit a new point-and-click enthusiast, Thimbleweed Park is the current release I would use to illustrate the best that the genre has to offer – and I don’t foresee that changing anytime soon. It is must-play, purchase-immediately sort of video game, and the stellar comedy, gripping mystery, and polished design of Thimbleweed Park fills me with hope when I wonder of Gilbert and Winnick's future creations. Terrible Toybox knocked it out of the park with this one, setting a new standard in the genre, and proving that even classic themes like those in Maniac Mansion can be revisited, revised, perfected for a whole new generation of gamers.